LEFT. LEFT. LEFT, RIGHT, LEFT. Long marches or just the usual non-stop running around dragging you down? Well with the Danner Men's 69110 USA-Made Fort Lewis Black Waterproof Insulated Military Work Boots, you won't have to worry anymore. By choosing the insulated ... (see full details) (see specifications) #DNN69110. LEFT. LEFT. LEFT, RIGHT, LEFT. Long marches or just the usual non-stop running around dragging you down? 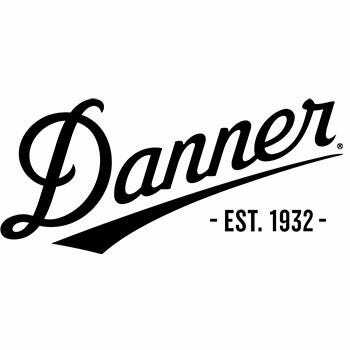 Well with the Danner Men's 69110 USA-Made Fort Lewis Black Waterproof Insulated Military Work Boots, you won't have to worry anymore. By choosing the insulated boots, you'll be comfortable as well as safe from whatever Mother Nature decides to throw at you! Worried about your uniform footwear trapping moisture and not trapping any heat? Constructed with 200 gram Thinsulate insulation, you can be assured that these boots will keep your feet warm in temperatures up to -30 Fahrenheit, and your feet will stay dry. Does your duty call for working around water? With these exceptional shoes, you won't have to worry about getting your feet wet (unless they are untied). These waterproof boots are manufactured with Gore-Tex, which works kind of like your skin - allowing moisture out, but not letting it in. So whether you're working around water, or just feel like you do, you know that your feet will be dry at the end of your long, hard day. This premium footwear is designed with Vibram 148 Kletterlift outsoles, which give you wonderful traction and stability. So come rain or shine, you won't have to worry about falling all over the place. These black boots are durable and have a lot of strength due to the handcrafted stitch down construction. This construction also gives you a wider platform on each of the American-made shoes for greater stability underfoot. The uppers on this footwear are crafted with durable, polishable, full-grain leather, while the stabilizing shanks are composed of lightweight fiberglass. Designed with the help of two career Army officers from Fort Lewis, Washington, these Danner: Men's 69110 Black USA-Made Insulated Waterproof Fort Lewis Boots are perfect for any weather and whatever the duty may be. They're approved by U.S. Army Forces Command (FORSCOM). I bought a pair of these boots in 2004 and have walked hundreds of miles in several countries. From jungle to desert, winter and summer. I've had them resoled at least 4 times and they are still waterproof. I've never skimped on price with boots and if you live in them 24/7 you will appreciate the term "you get what you pay for". I started out nearly 40 years ago in the Vietnam jungle boot and they served me well but after several fractures to both feet, legs and shattered pelvis my requirements as to quality and wearablilty escalated. In many assignments boots are included with other equipment but I'll stick with these. Some of the "tennis shoe" designs are lighter and maybe a little more comfortable but just can't take the abuse or be re-soled. I'll still use my old ones, my feet are used to them, and they still clean up pretty good but gettin a little rough around the edges. When I first got this pair they had an annoying and possibly lethal "squeak" with every step. I thot it was a design flaw...Duh, it's called "quality leather". A little mink oil between the tongue and the leather lacing and I was "stealthy" again. So do your feet a favor and save in the long run by outlasting any other boot out there...well, my opinion BUT based on experience....Accelerator rick. This will be my second pair of Fort Lewis boots. The first pair has served me well and is headed back to Danner to be recrafted. The pair that I am sending back I have worn on patrol for the last two years without issue. They are not insulated, however have kept me warm even during the harshest Vermont winter days. I suggest these boots to whoever asks and will not put my feet in anything else for patrol work. Thank you Working Person’s Store for the quick delivery. I sent my son these boots that is stationed in Korea. He can't stop thanking me for them. He says they have walked many miles with him in comfort. God bless our soldiers. I applaud these boots for being made in the States. They are well worth the price in EVERY way. USA all the way. These Danner 69110 boots are my best friend. Comfort is way more than I expected. They can buff to a nice shine, and they feel real good after a real long day. Danner Boots: Men's 69110 Black USA-Made Insulated Waterproof Military Boots is being added to your cart.